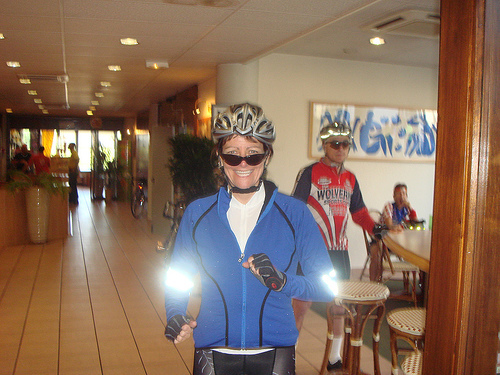 Maile Neel came to DC Randonneurs looking for longer rides and took it all the way to a successful completion of PBP. She reminded me recently that I failed to post a story she sent me about the April 28 Middletown 300K. I dug it out and enjoyed a fresh look back at the good times this spring. So, how does a person who rides more than 150/190 miles by herself make it into two ride reports? Remember, this is the person who looks at Bill Beck’s pictures and thinks, “Who are all those people? Were they on the same ride I was on? I never saw them.” I’ll chalk it up to pure talent, ignoring all other less flattering possibilities, including the probability that all idiot moves will be made in the presence of others, no matter how little time you are with them. After the Warrenton 300k I was filled with a false sense of riding ability. My beloved bicycle was not shifting gears too well on that ride, but given how flat it was, the techanical malfunctions were a nuisance but were not critical. Despite the shifting issues I rode most of the afternoon with Carol Bell and Chris Mento, who regularly drop me like I am on a tricycle. If I were a less than honest person I would withhold the fact that Carol had been suffering from food poisoning all day and also was having chest pains that were diagnosed as pleurisy. Glenn Martin was also with us, and on the Richmond Roundabout he casually pedaled right by me too. We picked up Linda G. late in the afternoon when we came across her sitting in the middle of the road massaging her hotfeet. Near the last control we came across Joel and his pals lounging about and they joined up with us and picked up our pace a bit. All of a sudden Andrea M. and her buddy came by and the fast train to Warrenton was leaving the station. It took all I had to hang onto the back, but it was an exceptionally fun way to finish my first 300k. I took my bike into the shop the next day but they couldn’t find anything major during a quick once over, which was all they could do on a busy Sunday afternoon. They adjusted a few things and that was that. I had finished the ride feeling strong but thought I would be taking the next weekend off – or at least I would have an easy weekend and just do a century one day. You know, check out the bike on a ‘short’ test ride. Mother of All 300k’s next weekend (see, you already know something I did not know). And Lothar promises to ride a leisurely pace and to ride with me all day. Maybe I will go. I’ll decide later. I’ll see what time I can get out of work. If I can get out and get some ride-related errands done by 6:30 and I can get packed up to leave town by 7:30, I’ll go. At 6 p.m. I am still in a meeting. At 7:45 I am still at REI. At 10 p.m. I am still in my kitchen with bike parts and gear all over the floor, charging all rechargeable items, changing my saddle to see if I can get the saddle sores to occur in just a slightly different place than last week, and putting a rack on so I don’t have to put a week’s worth of clothing layers plus food in my back pockets. Oh yeah, and most importantly putting on more and better tail lights so I could be seen more easily (Joel and Chris, I listened to you). By this time I am wise enough to decide I will not drive out Friday night and now my decision point is seeing how I feel when the alarm goes off at 1:45. If I want to sleep, I’ll just turn off the alarm. If I feel o.k., I’ll drive out to Middletown. I wake up at 11:45, 12:45 and 1:45. Despite not being rested, I feel good enough to get up when the alarm goes off. I eat a big pile of food on the way out and arrive in Middletown at 4:15. I have plenty of time to eat Liz’s fabulous baked goods prior to starting at 5 a.m. Already I am better off than last week which I started with a calorie deficit due to an alarm malfunction at HoJo’s. Very quickly after the ride starts, things go downhill (this is before the incessent uphill after uphill after uphill starts) when I find I cannot breathe due to allergies. The air comes in but my lungs are just too clogged with pollen to take up any oxygen. I fall behind most of the riders (this typically happens even without allergies, but today it happened earlier than usual). As the sun comes up I start leap frogging with George and Nick. Although I had never met him before, I can recognize Nick by the big white spot on his rear (more on this mysterious but diagnostic characteristic later). I am thinking these two really have an odd riding style, they speed up a lot and pass me, then they drop way back. I am sure my pace is utterly consistent. I happen to be just ahead of them when I decide it is light enough to turn off my headlight to conserve batteries for the darkness I know I will experience at the other end of the ride. I am checking to make sure that the light is really off when I unexpectedly find myself off-roading. Barreling through a small ditch and across an uneven grassy patch, I somehow manage to stay upright, miss a telephone pole, and keep pedaling enough to maintain speed while I unclip, and roll gently to a stop. No really, I MEANT to do that. I just didn’t think the day’s ride was going to be hard enough for me so I wanted to do part of it cross-country. Alternatively it could have been that I was looking for a shortcut home right after finding out from Nick that THIS WAS the Mother of All 300k’s. What? How did I miss that? Regardless, George and Nick sure seemed to keep their distance from me after my cyclocross demonstration. They did crack many jokes from a safe distance, all of which were greatly appreciated. They were, however, not with me when I noticed I had picked up a hitchhiker in the field. I looked down (only briefly so as to stay on the road) and notice one of those really skinny red earthworms dangling from my left sandal. Sweet! It was a nice addition to the grass blades that were sticking out everywhere from my fashionable footwear – riding sandals with toewarmers over the toes but inside the sandal straps. The toewarmers were an addition from last week’s footwear which caused frozen toes for the first 2 hours. After thorough testing, the toewarmer/sandal combination is highly recommended. In her ride report Lynn mentioned the big trees and shrubs that were in bloom along the ride. They were stunning and did keep me inspired. But when you go my pace up hills you also see the beautiful violets and phlox that formed a mixed purple and pink ground cover, as well as the adorable blue irises (*Iris lacustris*) that were no more than three inches tall and two inches wide. Simply awesome. They made climbing without a 2nd, 3rd, or 4th gear tolerable if still “somewhat” frustrating. The nuisances from last week turned into real issues on this hilly extravaganza. The bouncing out of 1st gear was so unfun that even beautiful wildflowers could not make it OK. Many barrel adjustments later, I could stay in 1st without holding the shifter all the way over, but it was either 1st or 5th at the low end for the entire ride. Those of you who know me know I don’t push gears well so I was frequently spinning my brains, going nowhere on moderate hills. The steep hills were actually better. At the first control I saw Lothar for the first time since the beginning of Back Road. He said he would ride with me but I would have to hurry because he wanted to leave. Having just arrived, feeling that food was more important than anything else at that particular moment, and not wanting pressure, I told him to go on. There is nothing worse than having someone tell you they want to ride with you and then put speed pressure on during the ride or later tell you how much they sacrificed to go slow with you. I opt for solo rides anytime over that. Anyvway, that was the last I saw Lothar all day. So much for the invite to ride together. Fueled with my egg sandwich and biscuit plus some of George’s pancakes I was back on the road. I swear it was snowing for a brief time at this point. Maybe it was just flashbacks to the snow drifts we rode through during the last ride from Middletown. What is it about Middletown? I leapfrogged a bit more with George but didn’t see Nick again until the Slanesville control. Here I figured out what generates the white spot on his shorts when he comped me some of his awesome bed sore/diaper rash medicine – the thickest white goo I have ever seen. I’ll let you fill in the rest. After having to beg some medicine from Glenn last week, I bought my own tube of A&D (one of my ride related errands Friday night) but figured 4 ounces of it was too much to carry in my newly acquired rack pack. At that point in the ride I wanted to put on the entire tube but it was sitting back in my car. Anyway, George and Nick left that control before me as I waited with Jim’s recumbent while he was inside ordering a burger. I left the control anticipating the promised ‘flat section’. When it never arrived, I figured I had taken a wrong turn. This was the low point in my short randonneuring career. I have thoroughly enjoyed every ride I have been on but know that people talk about having really low points. This was mine. It was the first time I thought I was not going to finish and I didn’t care. I always say when this becomes unfun I will stop. This was unfun. The cue sheet provided an emergency number, but clearly indicated that ‘tired is not an emergency’. Now that is where the cue sheet author is just plain wrong. This tired was definitely an emergency. I was praying for a secret control where I would latch on to the vehicle like a limpet and make them take me back with them when they went. They would have to pry me loose from the car if they refused to take me back. I was so certain I was on the wrong road though I figured I would miss the secret control that I was fantasizing would save me. One side of me was saying, but you are along this river, it must be the correct road. The other side was saying, this is not the correct river, the road along the correct river is flat. The correct river is in a parallel valley that you somehow missed. Then I start thinking maybe the correct road is in a parallel universe, like maybe one where bike seats are comfortable. The worst part is I think I was having this conversation out loud. Oh, I forgot to mention the headwind on this ‘flat’ section. Throughout the day it seemed that no matter which way we were headed we were headed into the wind. But this section was particularly bad. Relieved to finally see a confirmatory road sign at the next intersection (I love T intersections), I realized I was not disqualified – but was this a good thing or a bad thing? I thought of calling one of my girlfriends for a pep talk but I didn’t know what she could say to me to make me feel better so I just kept pedaling. Not to mention there was no cell phone reception. My next excitement came from actually seeing riders again when I spotted Lynn and Gordon at a store near the turn to go back up Wolf Gap. A bit later I saw Nick up ahead of me on the climb – by this time I could recognize him from a distance and did not need the white spot to tell for sure it was him. About this time I heard what I assume was the same coyote Nick heard. Like when I see vultures I was thinking, I may be moving slowly but I am still moving – so back off! After starting to close in on Nick for awhile, he pulled away again. This is the point at which I realized that it probably was not George and Nick who were inconsistent in their paces, but rather it was me. The fact that this realization totally cracked me up is evidence that the cognitive abilities were starting to slip. If I had been talking to anyone other than myself, they might have pointed out the ‘starting’ was a misconception. This cognitive slip had also happened to me on the Richmond Roundabout at the second Subway feeding frenzy of the day. My brain knew I wanted a turkey sandwich but my mouth could not form the words coherently so I acted like I didn’t speak English very well and did a lot of pointing. Later when I described this pace variation issue to Nick he solemnly informed me that his riding pace was very consistent but George definitely sped up and slowed down a lot. Personal realities are fabulous. During the long silence that followed, I remembered seeing LYNN’s name as one of the perpetrators. Perhaps sensing the potential danger she was in, Lynn quickly turned all innocent and denied any responsibility for the ride finish, blaming the last few hills completely on Matt. Like the first 180 miles of hills were not part of the problem! Matt was not there to defend himself. Maybe the Minebank Road hill spirits knew she was lying to me and that is why they pushed her and Gordon over on that last big hill. Honestly, I never touched them. Really! Anyway, it was dark; you can’t prove anything. Upon arriving at the loveliest Super 8 Motel I have ever seen, I got a Special Olympics hug from Liz as well as the round of applause from the nicest people in the world (gosh, let me see… was Lothar there? Hmmm, I don’t remember seeing him). Then I went right for the pizza box and all memories of pain and low spirits from earlier in the day were erased from the memory banks. Just like all my GPS, heart rate, and cadence data from the Warrenton ride the week before. 5) 4 ounces may not be too heavy, depending on how badly you need the substance that makes up that 4 ounces. Sunday afternoon found me in the bike shop where my bike was returned to health. I was going to march in all authoritative and demand that my bike be put in good working order. Instead I burst into tears and barely eaked out, “I can’t ride my bike. I need a bike I can ride.” Oh yeah, now that’s authoritative. Thanks to the bike shop boys my baby is now running so smoothly I think I might have to do next weekend’s 300k to see what one is like with all my gears. Or not.